House of Mirth: Happy Birthday, Aldo Buzzi! 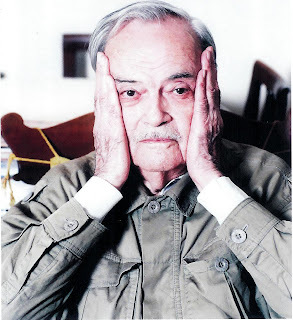 On this very day, the literary magpie and champion raconteur Aldo Buzzi turns 97 years old. Surviving to such an advanced age is itself an accomplishment--but Buzzi, of course, is additionally the author of such gems as Journey to the Land of the Flies, A Weakness for Almost Everything, and A Perfect Egg. A couple of years ago, he described himself to one interviewer as a "young writer." No doubt he was alluding to his status as a late bloomer: he studied architecture in the Thirties, then moved to Rome when the war broke out and found employment at Cinecittà. Working with such giants as Federico Fellini (with whom he shared sartorial tips) and Alberto Lattuada (whose sister would become his longtime companion), he did publish Il taccuino dell’aiuto regista (An Assistant Director's Notebook) in 1944. For the most part, though, Buzzi's own career as a writer remained on the back burner, even after he moved from the film industry to publishing. For many years he worked as an editor at Rizzoli--always the bridesmaid, never the bride! But in 1972 his Quando la pantera rugge (When The Panther Roars) appeared. Then came Piccolo diario americano (1974), followed by such gastronomically driven productions as L'uovo alla kok (The Perfect Egg) and La lattuga di Boston (Boston Lettuce). Even if your book isn’t a best-seller, it will always represent a gold medal for the publisher and editor, who are trying regain their honesty after having published so much junk, trash, garbage, which is voraciously read by people who devour salami sandwiches with peanut butter and jam. It's full, no vacancy. There's no burial because the coralline rock is too hard, it makes digging too difficult, so the tombs are miniature whitewashed cottages, and the cemetery has become another city neighborhood. Several streets cut straight across it. The houses along the adjacent streets have, like all houses in Key West, a veranda from which, seated in a rocking chair, one can enjoy the silent vista of the tombs, a vista without a hint of the macabre--rather, it infuses the observer's soul with a calm satisfaction at being alive, enjoying the sun, remaining at large. It's a cemetery, but there's no room left. Perhaps here death is, for a moment, suspended, put on hold, at least during these vacations, and we can still, as we did in youth, believe ourselves immortal. A few steps from the little monument to those who fell in the last two wars, an inscription appears on the wall, which, covered in quicklime more than fifty years ago by a hurried hand, has gradually been brought back to light by the seasons. 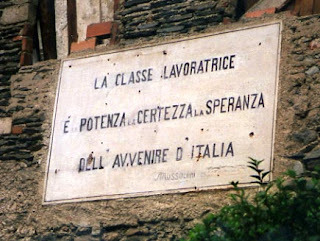 The working class is the power, the hope, and the certainty of Italy's future.—Mussolini. It was a phrase almost certainly uttered during some great rally in that winning voice of bronze, and greeted with applause. "Your Excellency," says the man, in a voiced infinitely less bronzed than the one that had just echoed forth. "Excuse me, allow me to make one comment. If the working class is the hope of Italy's future, it can't also be the certainty… And if it's the certainty, it can't be the hope. Do you seen what I mean?" My father saw Mussolini at close range in Milan, when the future Duce was running a newspaper, Avanti! He found himself seated in front of him on a streetcar, just a few feet away. He would later recount—while tucking one corner of the napkin into his collar and gazing at the steaming plate of spaghetti in front of him—that he had been struck by Mussolini's round, black, elated eyes. They had that magnetic power that would later allow him to stand on a balcony, scream out the kind of absurdities I have noted above, and be acclaimed by the throng. Having said this, my father would thread a few strands of spaghetti onto his fork, twirl the fork, raise it slightly above the plate, lower it again, wrap the spaghetti tighter, and with visible satisfaction, introduce a lovely forkful of spaghetti into his mouth. His companions at the table did exactly the same thing. We were practically a single being. They were besides the point. Spaghetti, as everybody knows, is the power, the hope, and the certainty of Italy's future. The quick-and-dirty translation is my own. The gentle humor, skepticism, and pro-spaghetti vibe are all Buzzi's. I wish this wonderful writer the happiest of birthdays and hope he'll celebrate many more. ADDENDUM: After I posted the birthday message above, Prudence Crowther was kind enough to send me this photo, snapped some time ago in Runo, a tiny Italian village near the Swiss border. What we see is in fact the very sign described by Buzzi in "The Future of Italy." He's hardly the first Italian to incorporate such blustering pronunciamentos into his work. In Goffredo Parise's Abecedary, which I translated back in 1990, the reader encounters this pair of faintly dismissive sentences: "The train stopped alongside a dark stone building, with sparks flying from its chimney, and up on a long whitewashed strip a slogan had been written: Believe, obey, fight. Mussolini. But in the blueness of the imminent night it was scarcely legible." I suppose that Buzzi, as a self-described author of fiction, should have invented the sign rather than borrowing it from the vast prop room of daily life. It was there for the taking, though, and he took it. Thanks for introducing me to Buzzi and for the delightful translation of "The Future of Italy," which, along with "Key West, 1998," and the note from Saul Steinberg made me very, very happy. You're very welcome. We don't seem to produce such brilliant miniaturists as Buzzi in this country--maybe it's the wide open spaces and all--and of course Saul Steinberg's acerbic voice is always good to hear. Come to think of it, Steinberg was also a brilliant miniaturist. But he was a transatlantic hybrid of sorts: a Romanian by birth who corresponded with Buzzi in Italian for more than fifty years. Delicious post, J! What a pleasure, in the "brilliant miniaturist" mode, this site. Actually, wouldn't it make a marvelous print magazine? Can't you just see it? Where are the backers...? There’s always a lot of different challenges everyday. You’ll just have to figure your way out. thanks for sharing. bizFlats – Stylish short-term apartments,lofts and villas in Barcelona - including corporate flats in Barcelona, barcelona holiday apartment, Barcelona apartments and Barcelona vacation rental.